This book talks about justice, divine plan, paul, justification, covenant, righteousness, salvation, abraham, piper, TDGBath. 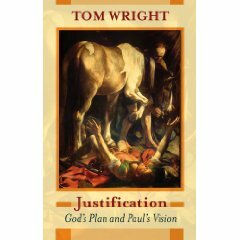 In what has become known as the 'new perspective' on Paul, Tom Wright has proposed a vision of the apostle's central message that does full justice to all Paul's letters. In particular, he focuses on the God-centred nature of Paul's gospel, arguing that 'traditional' readings of Paul can suggest that the apostle's message is simply about us: our sin, our justification, our salvation. Ambitious in scope, yet closely argued, Justification: God's Plan and Paul's Vision suggests that this crucial understanding of the theology of St Paul, and thus of the gospel of Christ, is urgently needed as the Church faces the task of mission in a dangerous world.